I have just been informed that this work has been selected as a finalist in the acquisitive Birchalls Tertiary Art Prize . The prize is worth $2,500 and although a chief critereon is innovation, i suspect they chose to shortlist my work to hang something a bit unconventional and 'in your face'. But because the winner will hang in the gallery's permanent collection, i expect that in the end they will award the prize to a more conventional canvas. I'll find out 2 September. Have been revisiting the work of the Canadian expressionist, Phil Iverson. 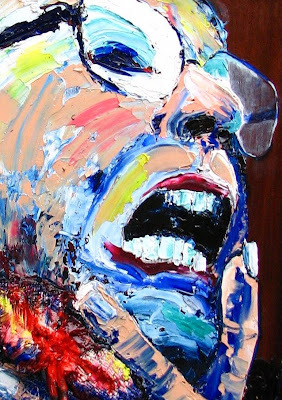 I'm excited by his bold use of colour and impasto brush work in portraiture. 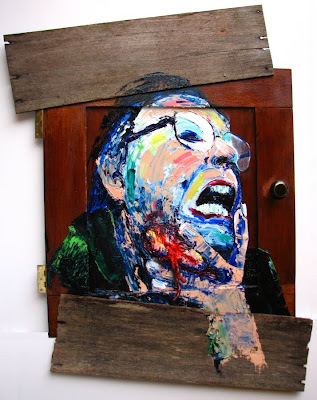 And his use of found timber for painting surfaces. I enjoy the strength and drama of his work. And so to this experiment. i haven't fully worked it out yet, but this painting is about portals and about insides and about Time. It is painted on a spare varnished wooden door to signify Doorways into this life and out of this life. And the trauma of passing through some of those doors. Some doors we can't wait to open. To turn 21, to be able to drive a car or buy a drink or take a bank loan. To step through the door of graduation or maybe of marriage. But other doors we hope will not to have to open. The door of a prison, or the door to the operating theatre, or the oncology unit... or the door to the crematorium. Doors of pain. Doors of shame. Doors of doom. 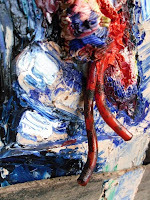 and the painting is also about insides. Insides out. Outsides looking in. Subjective-Objective. Self-revelation. Self-portraiture as a kind of public self-immolation. Blood speaking to blood in a language more ancient than words. It passes over the boundaries of national borders and across the divide of centuries more effectively than a Google translator. i became interested in old images of anatomy and autopsy as a metaphor of our concealed inner selves, a way of depicting what lies within, hidden from the world and even from ourselves. for this work, I've also been interested in exploring Brett Whiteley's breaking of the surface plane (on what is otherwise a fairly conventionally painted surface, say in Alchemy. And so to bring these interests together i've created a three dimensional 'wound', a fissure through which internal anatomy becomes external, through which Time ebbs. 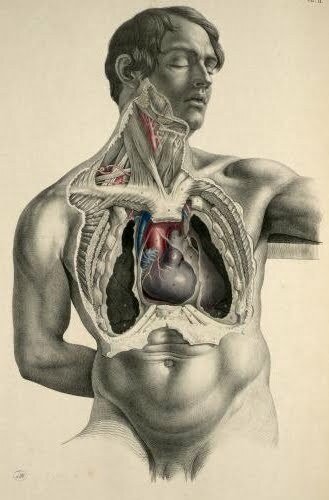 It is built from builder's putty extruded through fly-wire, with dangling plastic tubing to suggest arteries. Maybe i’ll rework the found timber some weeks from now. cut it into narrower sections (adjust compositional elements)? though i did want the figure hemmed in and claustrophobic inside Time. attack it with a blunt weapon (the violence of Time)? ... Igor, hand me my Berzerker axe. Harry, what a manner of putting those colors!!! Brave and audacious. I like those brush strokes, you know. And how experimental! I'm impressed by your art once more. Thank you. Hi Manel. I just looked at Phil Iverson's work and tried to teeter on his shoulders. i have come to believe that painting is an analog of life. We must live by courage - and paint by courage. For me, if it doesn't feel dangerous, if i don't feel out of my depth, i wonder if i'm learning! gracias, amigo. Upon seeing your post, for some reason Pink Floyd's "Wearing the Inside Out" pops into my head. Your work does that to me - it provokes immediate response. I like it that you don't shy away from blood or scenes of distress. Me encanta tu atrevimiento!! los colores son alucinantes, creo que te has superado, felicidades. ciao Laura. In questo lavoro ho preso rischi ed i miei dubbi. È proprio lavoro ha un tale tripudio di colori mozzafiato. Così le tue parole di sostegno sono preziosi per me. Thanks Brian. I try not to shy away from any kind of mark-making or image-making. Boldly going where i haven't been before is the mission of my project. But i'm thinking maybe the innards thing is a bit melodramatic. I've started work on something completely different, using fabrics, but think i might paint a second verion of this one, without the throat wound, just the riot of colour and energetic paint application on a conventional canvas. Thanks for your support. Hey, have a great week. Hola Rosa. Quería ver hasta dónde podía empujar la imagen de la cara llorando. Así que tuve que asumir riesgos. Gracias por tu comentario de apoyo. Gorgeous! A paint that let without breath, it passes us the anxiety. 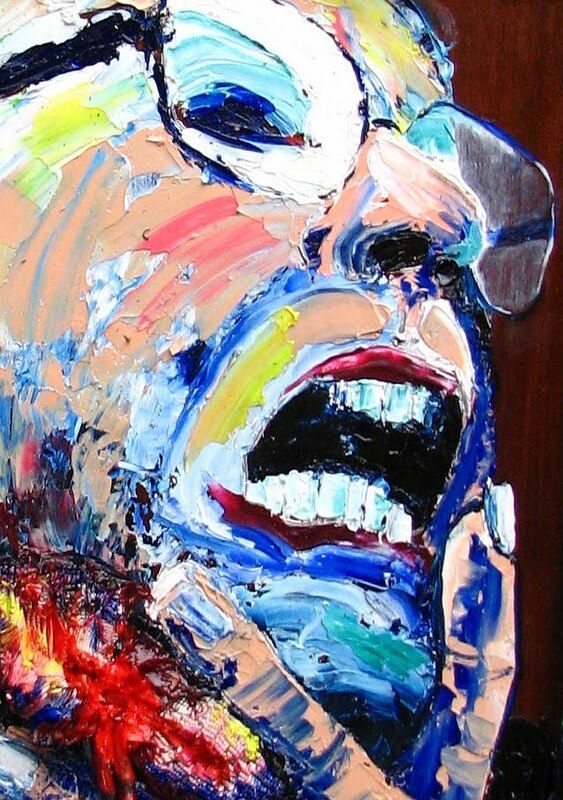 Tremendous power with the color and the brushstroke. Great work Harry. See you and all the best. this is so good . briliant . no words . i really loved it . Thanks, Lozzano. Do check out Phil Iverson's work sometime. His are huge canvases. My much smaller scale is a bit 'tight'. Problem is if i start to work 2x3 meter, where will i store it??? But i WILL try one day! hi Caio, err, Melissa. Your father is really a very kind and generous man. But he mustn't encourage me. He has no idea of the abortions i am capable of! Have a good day. Wow, I', gob smacked - brilliant, absolutely surreal and - well - just keep doing what you're doing. It's wicked! Great!! Muy fuerte, con la yugular así, dudo que dure mucho tiempo entre nosotros. Me encanta también la mano y sobretodo que hayas utilizado material reciclado. Gracias por tu comentario,Harry,tus obras son magnificas,tan llenas de color y expresión,simplemente perfectas. thanks Carolann. In some way i ought to keep repeating, doing a series, until 'ive quite exhausted that vein. But the theme, while cathartic, is also a bit scary to work on. The technique i will no doubt return to and keep developing. But at the moment i'm surveying the range of mark-making to discover which i am competent with and find expressive, so will keep erratically bolting all over the place. Cheers. Gracias, dv. There is an English expression "to go for the jugular", meaning to attack the very essence of a matter. This is the goal i set myself. I may or may not have achieved that goal with this painting, but at least it has a piece of jugular in it! Gracias, Ana.Usted es demasiado generoso. Thank you for the follow Mr. Kent. So you want to be an artist when you grow up? I'm still trying to get there from here in Chicago. I love this self-portrait. My birthday's coming up the 'aging' lable is listed first for this post. It's sorta how I feel. Well done. thanks, Davida - your 'Self-Portrait with Goddesses' is stunning so of course i had to follow! As for when i grow up, i fear that be could still be a little way away (i believe Chicago is a bit closer so good luck with the birthday). This entire blog is themed around the emotions attaching to moving into old age, so more to come. Stoicism next, methinks. Thank you Rolo. Your work just blew me away, impecable, left me feeling slip-shod ... but refreshed by having seen it. And inspires me to do some hard work. Thanks for coming by. 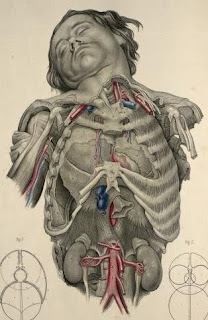 The old images of anatomy and autopsy are great. I'm also interested in this. I soon will visit a university 'museum' with visions on the inside of our body for real. I find that fascinating. Thank you for leading me to Brett Whiteleys work. I didn't know him. hello. 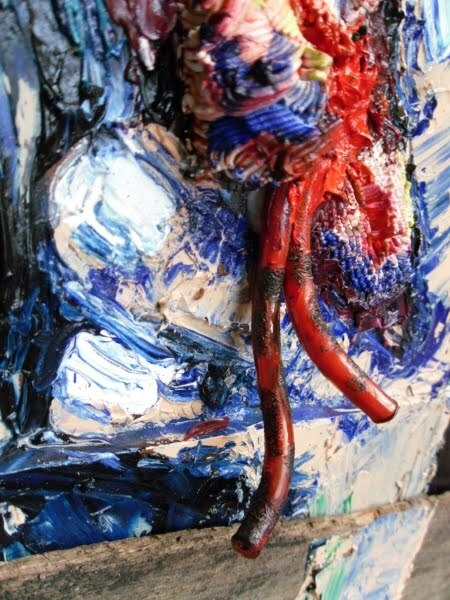 I am glad you came by my blog-- you have a very intriguing blog here- and your work is bold and expressive. good morning Momo (it's early here and the penguins are still yawning and rubbling their their tired little eyes), what a great way to greet the day - with your enthusiasm! Thank you so much. I'm currently working on 4 paintings at once, one a huge landscape and i'm off to Melbourne for a few days next week, so in the week(s)before my next work, i'll post a blog on Brett, the Aussie prodigy and icon. For instance, one thing he said was, "Art should astonish, transmute, transfix. One must work at the tissue between truth and paranoia". And that's the territory i aspire to explore, beyond the safety of the simply decorative. and good morning to you, Donna. How could i resist your blog - images of work that is complex yet restrained, subtle and nuanced, grounded in nature, essentially spiritual, and, like people, each a narrative teasing to be deciphered. Thanks for coming by and running your experienced eye over my exploratory studies. hmmm, ‘intriguing’ sounds, well, sounds ... intriguing, :0). Yes, teutonic expressionism is my game (for now) as i seek to boldly go where i’ve never been before. I love your Beckett quote which pretty well describes my journey so far. I'm very impressed by this portrait. I love this way of painting. Gracias, Andrés. Thanks for dropping by to take a look.